Hello my lovely ladies. Belated mother's day wishes to all of you. Hope you all had a fun filled sunday and mother's day. I know I had a great day. As we were out for almost the whole day shopping in the mall. The day was so full that I could not post this recipe yesterday. I wanted to bake these muffins since the time I had seen the recipe on nigella.com. The recipe seemed very simple and decadent without being overtly sweet. Just the way my mom would have liked it. So these muffins are for my mom who at times is quite child like herself. Maybe that is the reason she bonds so well with Purvi. You should see the way they talk to each other. It is almost like watching two little girls talking. It is a sight that can warm the coldest of hearts. Since my mom and Purvi are so close to each other, I decided to shoot the muffins with Purvi. I must say the photo shoot was something that I will remember for the rest of my life. I had first thought of shooting Purvi with a tray full of muffins. The moment I placed the tray in her had she got nervous and refused to hold it. So I had to give up that idea and I asked her to hold this single muffin. After that the story got a little different. She seemed get way too comfortable and she started to dance with that muffin in her hand. I had to struggle for nearly 10min before I could get the shot above. More than this recipe or the shot I think the memory of Purvi dancing with that muffin will always stay with me. Golden syrup muffins- As the name indicates, these muffins has golden syrup in them. Wikipedia defines golden syrup as an inverted sugar syrup that is made in the process of refining sugar cane or sugar beets. Golden syrup is an amber coloured liquid that is used for baking or favoring a variety of dishes. Often times it is also used as a substitute for honey. Lyle's golden syrup is a popular brand. I have found that this amazing liquid has the ability to enhance the flavour of anything. That includes frosted cakes and ice creams as well. And this muffin was no exception. I was surprised at how a few table spoons of this syrup could transform this ordinary muffins to some exotic. Apart from being ridiculously simple to put together, they make a great breakfast muffin as well. I can shamelessly confess that we finished a batch in one go without any regrets!! In a bowl, mix the flour and the baking powder, sift and keep aside. In another bowl, mix the melted butter and the sugar and beat till well combined and airy. Allow the muffins to cool in the pan for 5min before transferring them to the wire rack for the muffins to cool completely. Note: I have used only 1/2 cup of sugar as I prefer these muffins a little less sweet. You can increase the quantity to 3/4 cup if you prefer the muffins a little more sweeter . Delicious muffins! !Hope u had a great day yesterday,Belated Mother's day wishes too!! Wow that was really soft n spongy..... Love the first pic.... By the way what is golden syrup ? Happy (belated) Mother's Day! What a great, simple muffin recipe. 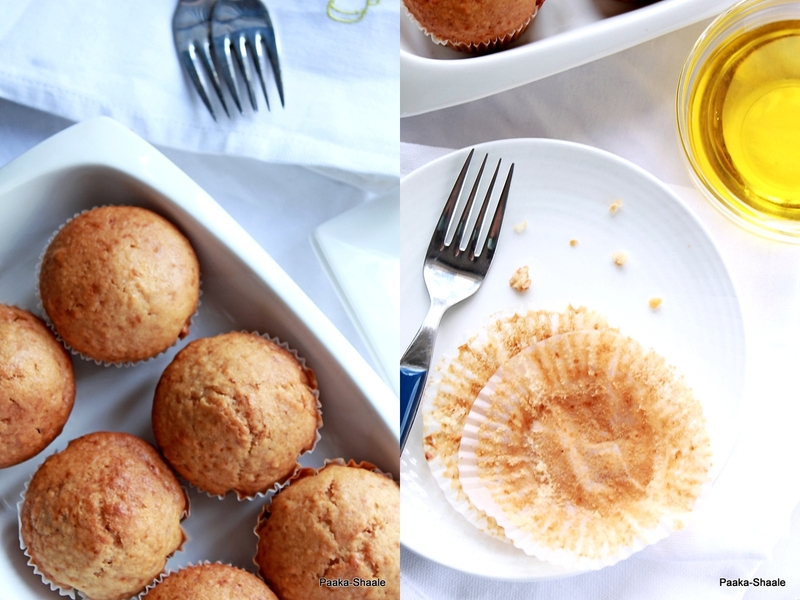 Thise muffins looks super spongy and quite addictive, loved the first click.. They have come out very fluffy and spongy, liked the first snap. ooh lala. I would love to try this recipe! Happy belated Mother's Day. The muffins look so moist and delicious! Thanks for sharing this great recipe. what is Golden syrup? Love to try them. That's very sweet :) And she is a great hand model! The muffins sounds delicious and just the kind I enjoy a lot. what beautiful clicks!! good photographs are a weakness of mine..:) ..and am gonna be looking around for more of your lovely eggless cake recipes.. as I have a nephew who is allergic to eggs!! great stuff!! Thanx for the wishes and dedication.